It’s that time of year again, the Christmas holidays are just days away and I haven’t even started my shopping yet – Crumbs!!! But that’s not important right now, because we’ve just spent the last week, going over all our favourite glasses and sunglasses from the last year and picked out our choice for “Best of the Best” in a variety of different categories and price points. We’ve come up with an impressive selection of prescription glasses and designer sunglasses that meet or exceed an exceptional level of quality, designed to a unique and impressive style that makes them stand out from the crowd, provide outstanding performance or simply offer unbelievable value for money. 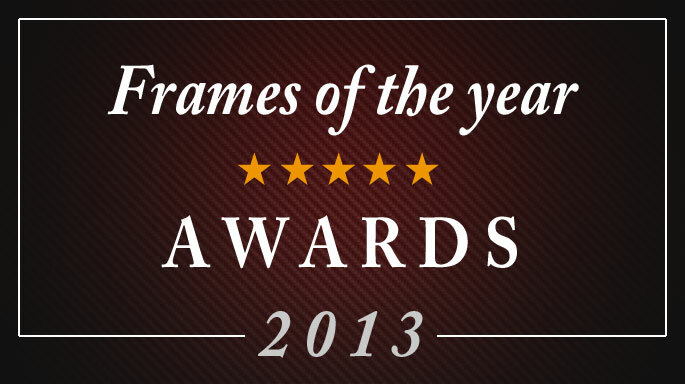 We strongly believe that from our selection of award winning frames, you can do no wrong. There is something here for everyone; and anyone would be more than happy with any single one of these frames. So without further ado, we have some awards to dish out. The original Savannah 2249 has been one of our best selling models since forever; demand was so high for our 4 original basic colours that in the Spring of 2013 we introduced some new colours to the 2249 collection bringing the current collection to 8 different colours. The Havana colour shown here has arguably been the most popular of the bunch with it’s slight transparent effect – the frame can appear to be a slightly different colour in a variety of lighting conditions. 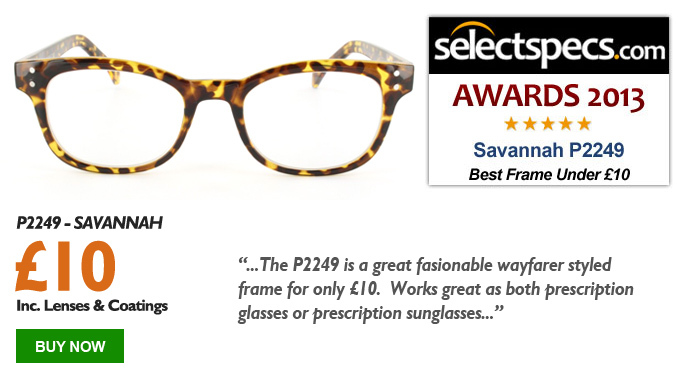 The Savannah 2249 offers exceptional value for money and impressive build quality at only £10 including FREE Standard prescription lenses and coatings. 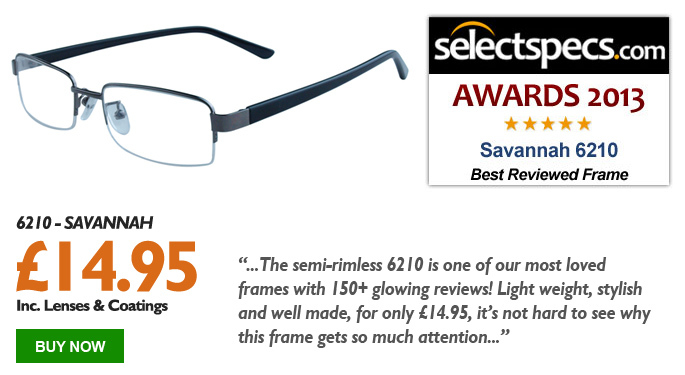 The Savannah 6210 Semi-Rimless glasses in gunmetal have proved to be one of our most reviewed and highest rated frames by our customers who absolutely love it. 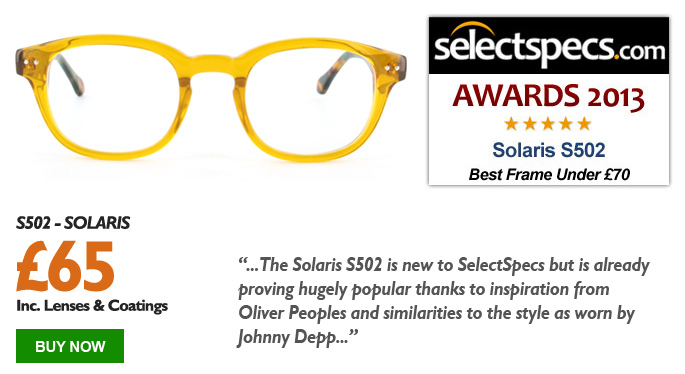 “…when the glasses came, we couldn’t believe how great they are, after paying nearly two hundred pounds elsewhere I will be ordering more very soon”. “I got these as a spare pair, but wear them just as much as my originals from the high street”. 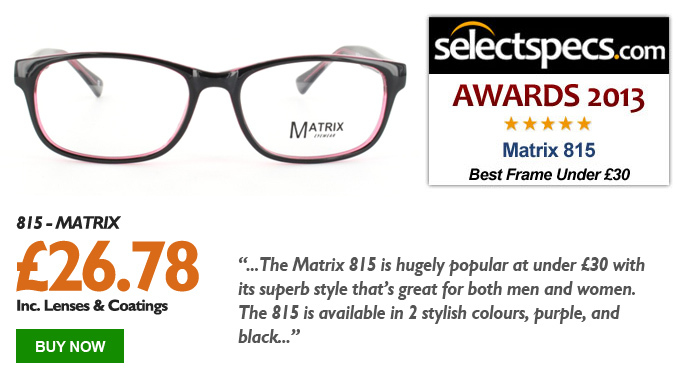 The Matrix 815 glasses have been a highly popular frame within it’s price range since we added it to our collection earlier this year. We feel that these prescription glasses have a great style that never goes out of fashion and the black frame with semi-transparent purple colour highlight gives them a unique appeal. 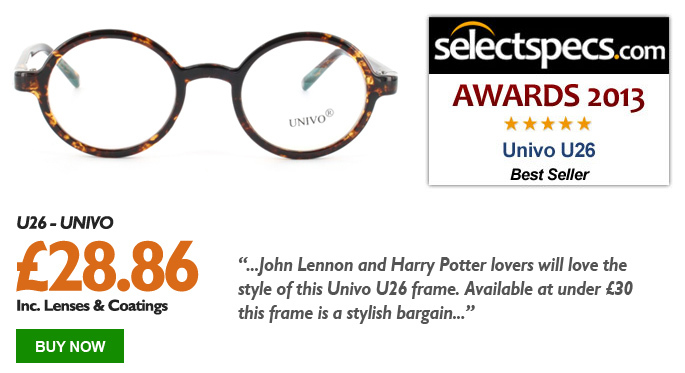 These Univo glasses have been absolutely flying out the door, our customers just love these frames as shown in this review snippet by one customer: “Good quality frame of a very definite style, picture a history/Latin teacher in the 1930’s and you’ll be there. I really like them; they’re very neat on the face, and a bit different and easily adjustable. Really pleased”. These brand new unisex glasses were only added to our site within the last month but proved to be a big hit at a local fashion show and have been getting lots of attention in our High Street Optical Store in Westgate-on-Sea. 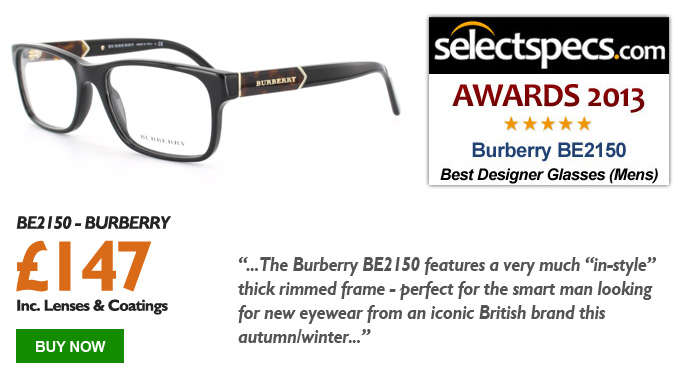 As soon as we saw these new Burberry frames come into the building we knew there was something special about them, they really grabbed our attention. We especially like the shape and style of the frame with the tortoiseshell colour temples and gold trim. Any man that has even the remotest interest in looking good this Winter should definitely consider picking up these fashionable frames. 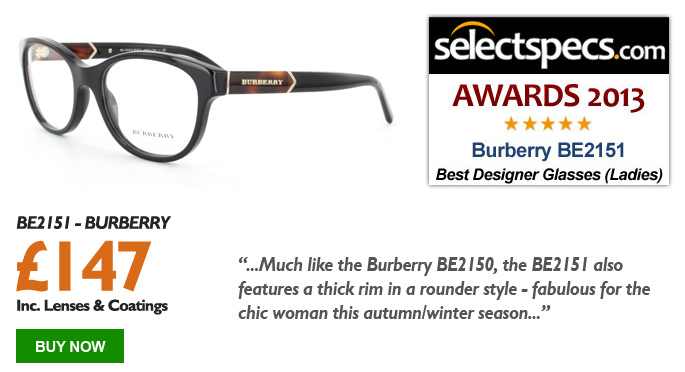 Just like the Burberry BE2150 Men’s glasses above, this BE2151 Ladies frame jumped out for almost the exact same reasons, but was clearly designed for the fashion conscience woman. This has all the same qualities and strengths as the men’s frame but a style that is uniquely feminine. Quite honestly, there is nothing we don’t like about this frame. 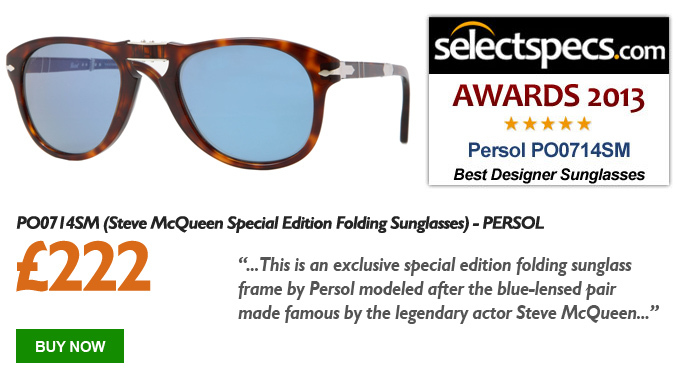 These exclusive Special Edition Sunglasses by Persol are modeled after the blue-lensed pair made famous by the legendary actor Steve McQueen. The folding design allows these sunglasses to be stored in the smallest of spaces in your pocket or car. Supplied with an elegant leather case with the “Steve McQueen” branding embossed on the front, these sunglasses just feel extra special and ooze quality… I want some – I wonder if I would look as cool as the man himself? 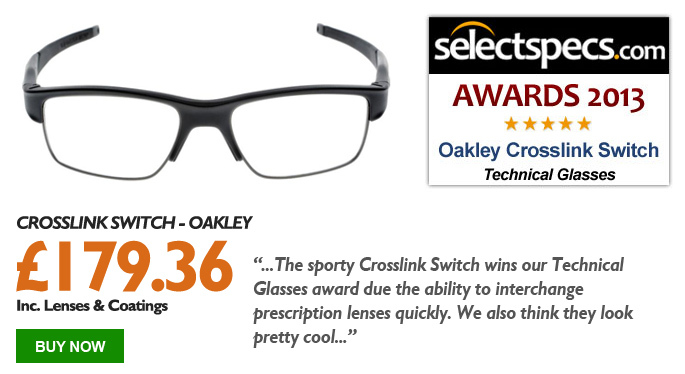 Last year we gave our Glasses of the Year Award to the Oakley Crosslink with it’s interchangeable arms. We were impressed with its sporty design and general innovation. At the time we said that we couldn’t wait to see what Oakley came up with next, so it was almost no surprise when they did it again and produced a frame good enough for our Technical Glasses Award this year. The Oakley Crosslink Switch obviously takes it’s inspiration from the original Crosslink, but instead of interchangeable arms, actually features an interchangeable lens system. This allows the wearer to easily swap the lenses as they please, so you can wear them as standard single vision glasses one moment, then swap the lenses to reading glasses or sunglasses the next. *This frame can be glazed with 2 sets of lenses if required. If you require the second set of lenses glazed there will be an additional charge as they will need to be ordered using our reglaze service at the same time. Be sure to let us know your requirements and follow the instructions on the product page when ordering this frame. Any Maui Jim Sunglasses have got a “WOW” factor to them; just try them on for yourself and you will see. Every customer that comes into our store and puts them on is blown away by the vision and colours offered by Maui Jim’s stunning polarized lenses. The one thing every person says when they put them on is “WOW”. 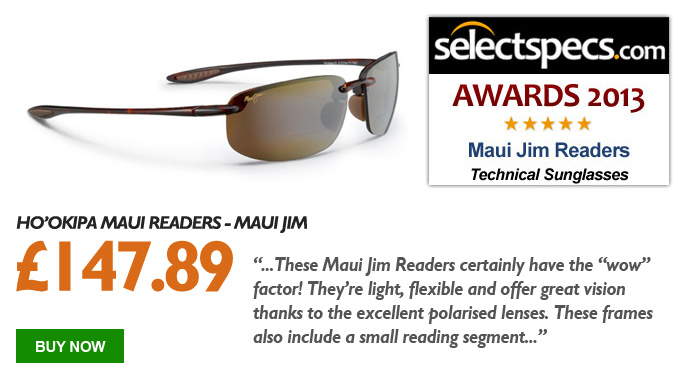 But these Maui Jim Ho’okipa Readers have got a little something extra about them thanks to their integrated bifocal reading section at the bottom of the lens. When wearing the glasses normally, the bifocal section is tucked away at the bottom of the lens – you don’t even know it’s there. But when you want to read a book by the pool on holiday and need your reading glasses, it’s not a problem as you just glance down and everything is magnified for you. Absolutely brilliant. Congratulations to all our winners, it’s been another fantastic year in eyewear innovation and design. We can’t wait to see how it will be topped in 2014.